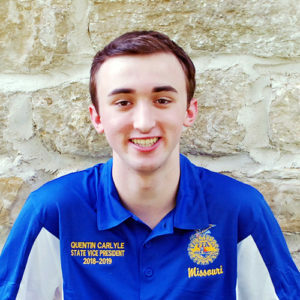 Saturday, Jan. 7, 2019 marked the start of the state FFA officer’s tour around the state to put on Greenhand Motivational Conferences. After a week of many new hotel rooms, fun workshops, wacky skits and amazing new FFA members, Friday brought the last conference for my team. Even after such an awesome week, my teammates and I were all ready to be back home and sleep in our own beds. As we traveled from St. Joseph to Jefferson City, we realized that this dream would be put on hold for another couple of nights due to 15 inches of snow forecasted to fall over the weekend. As we unloaded our bags into the two hotel rooms we would be stuck in for the rest of the weekend, we had a decision to make. The two days that followed were not going to be spent the way that we had planned them to be. We could pout over the outcome and spend the weekend miserable, or we could make the most of the situation and do our best to enjoy ourselves. We chose the second option and spent the two nights playing games, having fun and enjoying each other’s company. Our relationships were strengthened over the weekend. In the same way that my team had a choice, we all have the same choice each day. Frequently in life, our master plan is not followed. It is up to us to not be disheartened and give up, but instead to make the most of unexpected situations, adapt and press on.